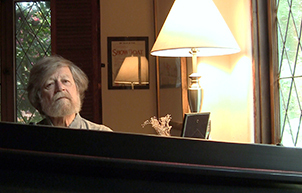 Shining Night: A Portrait of Composer Morten Lauridsen is a feature-length documentary and first episode of the series, In Search of The Great Song. 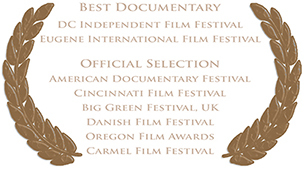 Winner of four Best Documentary awards since opening on February 7, 2012 in Palm Springs, Shining Night was named 'a heartening rarity' by Terry Teachout of the Wall Street Journal. Directed by first-time filmmaker Michael Stillwater and co-produced with his wife Doris Laesser Stillwater, it gives audiences a rare encounter with this National Medal of Arts recipient, composer of radiant choral works which inspire humanity and convey a spiritual transmission to singers and audiences alike. 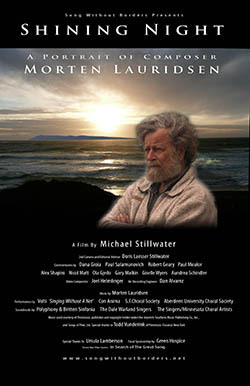 A companion giftbook, Morten Lauridsen's Waldron Island Reflections, featuring images and text from the film, is published through GIA Publications, Chicago. View film clips, read viewer responses, host a screening of the film, and if you wish to own a copy of the DVD or Soundtrack, see the Ordering page. You may also learn about the film series, In Search of The Great Song, of which Shining Night is the first feature-length episode. In Search of The Great Song is designed to inspire remembrance of an underlying connection through creative expression while exploring themes of singing and songmaking in particular. The series highlights expressions of an active movement of creative expression while focusing awareness on a worldwide phenomenon of people afraid to sing, or express their creative self, unless they believe their offering is 'perfect'.